I changed the decoration on the front door. It's officially spring, for me. 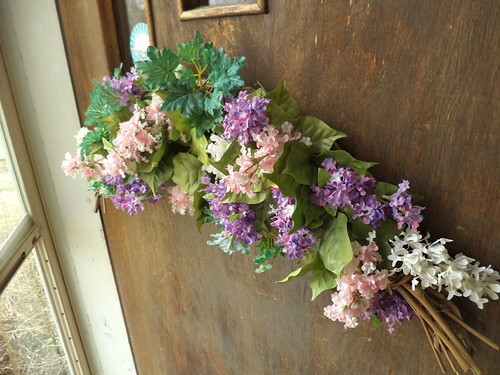 I have a wreath adorned with spring flowers; tulips, daffodils, lily of the valley. It's lovely but this holds a special place in my heart. Carole and I made this some 15 years ago. Once I take it down for summer decoration, I need to reglue a lot of the lilac sprays and put a better hanger on the back. I have, for the last 5 years, at least, said this every year, even when I put the other wreath on the door. One of the pink sprays was loose this year and fell off as I was hanging this on the door. I just shoved it into the depths where I think it will stay for the time being. Ah spring. The crocus are finally up. I've heard a cacophony of birds in the backyard. Something is making noise in the back beginning at 10:30 p.m. My initial thought is some sort of owl, but perhaps it's something else? It's not human, to be sure. I'm ready for spring. It's been a depressing winter.